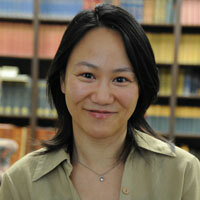 Yu-Fang Cho, associate professor of English and Women’s, Gender, and Sexuality Studies, is the recipient of a Cornell Society for Humanities fellowship appointment for the 2019-2020 year. Cho is also an affiliated faculty of the Asian/Asian American Studies Program in the Global and Intercultural Studies Department. "I am grateful for the Society’s support of interdisciplinary projects that grapple with big, urgent, and difficult questions, the value of which is not always legible in disciplinary-based humanities scholarship," Cho said. The Cornell Society for Humanities awards six to eight residential fellowships annually to scholars whose research relates to a central theme. The 2019-2020 theme is ENERGY. Fellows receive $50,000 and use the time to pursue research and writing projects, participate in a fellows seminar, and teach a course connected to their research. Cho will focus on revising her book manuscript, The Afterlives of the Nuclear Pacific: Indigenous-Asian Relationality in Transpacific Modernity. "I look forward to re-immersing myself in this project and bringing it to completion," Cho said. "I owe this to the people and societies who have been and are still being impacted by the legacies and ongoing effects of nuclear modernity." Cho’s scholarship and teaching bring several fields into productive dialogue: transpacific studies, transnational feminist and sexuality studies, and comparative ethnic studies. In her project, she strives to bring the critical insights from these fields to inform current debates in environmental humanities. Her project centers women of color and queer of color critique as "a key method to analyses of geo-cultural politics of environmental crises, in America’s Asia and Pacific," such as nuclear pollution. Specifically, she develops "queer ecological borderlands as a critical method to analyze the temporal and spatial displacements in post-Fukushima nuclear narratives, which are characterized by both the saturation of nuclear threats from Asia and the amnesia about nuclear bombings and bomb tests in the Pacific."